The big budget, highly anticipated “Justice League” film has finally arrived. 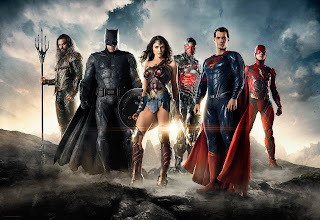 Following in the wake of the apparent death of the Man of Steel in “Batman v Superman: Dawn of Justice” (2016), “Justice League” finds Batman and his new ally Wonder Woman facing a sinister threat: Steppenwolf and his army of Parademons, who are searching Earth for a trio of ultra-powerful Mother Boxes. To deal with the fiendish, otherworldly foes, the iconic duo forms a new super team, recruiting The Flash, Aquaman and Cyborg. Thus, the Justice League is born. When it was announced in 2013 that Ben Affleck would play Batman in the then-untitled Batman/Superman movie (2016’s “Batman v Superman: Dawn of Justice”), the internet couldn’t handle it, and the haters starting hating, despite Affleck being a perfectly reasonable choice, with his square jaw, tall stature, solid acting abilities, and classic good looks. Although it wasn’t as controversial as casting Michael Keaton as the Dark Knight Detective in 1989’s “Batman” (and 1992’s “Batman Returns”), social media wasn’t a thing during the 1980s, so the Affleck flack was more immediate. Batman is the leader of the Justice League in the movie, a role he has taken on in certain modern comic book incarnations of the super group. With his “wonderful toys” and largely serious demeanor, he’s a good, classic, manly take on the character, but without Affleck resorting to the growling and grumbling of Christian Bale’s somewhat depressing (if still effective) portrayal in Christopher Nolan’s “Dark Knight” trilogy. Wonder Woman was the brainchild of Dr. William Moulton Marston (writing as Charles Moulton), a psychologist known for creating a systolic blood pressure measuring device that would play a significant role in the development of the polygraph machine. Unlike most intellectuals of the era, Marston embraced the comic book medium, and his creation became a feminist icon, as evidenced by her cover appearance on the cover of Gloria Steinem’s “Ms.” magazine #1 (1971). . Sadly, it took more than 75 years for the Amazon Princess to get her own live feature film—this past summer’s “Wonder Woman” starring Gal Gadot. The Israeli actress and model absolutely nailed the part, making the wait worthwhile. Gadot Wonder Woman, who tantalized audiences with a supporting role in “Batman v Superman: Dawn of Justice,” doesn’t appear to be able to fly like the comic book character (giving her something in common with Lynda Carter from the 1970s TV show), but neither does she pilot in an invisible jet. She’s super strong and beautiful, though, and wields a mean sword, shield and magic lasso, a.k.a. the Lasso of Truth. In short, she’s wonderful. The creation of the Barry Allen version of The Flash kick-started the Silver Age of comic books (Jay Garrick was the original Golden Age Flash, debuting in 1940). The Scarlet Speedster of 1956 and decades after was a blond-haired, blue-eyed, supernaturally fast, near-perfect hero whose only fault was, ironically enough, running late. Like many superheroes, he has a convoluted history. He died, was replaced, came back, etc. He was approximately the same age as Superman and Batman. In the “Justice League” movie, Barry is more like the Wally West Flash from the “Justice League” cartoon of the early 2000s. He’s young, impressionable and hyper, providing comic relief in contrast with the other, more stoic heroes of the group. The dark-haired Ezra Miller is a curious choice for the role, and many fans have complained that Grant Gustin, who plays Barry/Flash on the current Flash TV series, wasn’t brought onboard to play the character. Regardless, Miller Flash remains the fastest man alive, but, like most incarnations of the hero, he’s slower than the Silver Age version. In the “Justice League” movie, Aquaman, a.k.a. Arthur Curry, has yet to become king (he’s heir to the throne of Atlantis), but he’s leagues above the campy character many of us old timers remember from the classic cartoon, “The Super Friends,” and he’s even more imposing than some of his more impressive comic book incarnations. Covered in tattoos and muscles, clad in a regal, but tough looking battle suit and wielding a long trident, Momoa’s Aquaman is no fish out of water. Although he’s appeared in various live action and animated shows, including “Green Arrow,” “Teen Titans,” “Smallville,” and “The Super Powers Team: Galactic Guardians,” Cyborg is easily the least famous of the six featured superheroes in the “Justice League” movie. The character was created as a member of the Teen Titans, but was made a founding member of the Justice League during a pair of modern DC Comics reboots (2011’s “The New 52” and 2016’s “DC Rebirth”). Fisher Cyborg appears fairly faithful to his comic book counterpart, wearing a hoodie to obscure his half-man, half-machine appearance and using his bionic powers to fly, manipulate technology, perform feats of super strength and turn his arms into cannons. Cyborg looks smashing in action, despite his relative obscurity. Some argue that Cyborg was only included in the film strictly for racial diversity, but the John Stewart version of Green Lantern, a more well-known character, could have filled that role. However, as Bruce Wayne says in the “Justice League” movie, “The world needs Superman,” so he does return. Henry Cavill’s portrayal of Superman, which debuted in 2013’s “Man of Steel” (the first installment in DC’s shared movie universe), is darker and more conflicted than most versions of the character, but he certainly looks the part and does a more than serviceable job. For longtime fans, no one will ever replace Christopher Reeve as the definitive live action Superman, a sentiment Cavill himself would probably understand.